The new season is officially here and the Detroit Red Wings enter the campaign with players old and new looking to make their mark with the team. 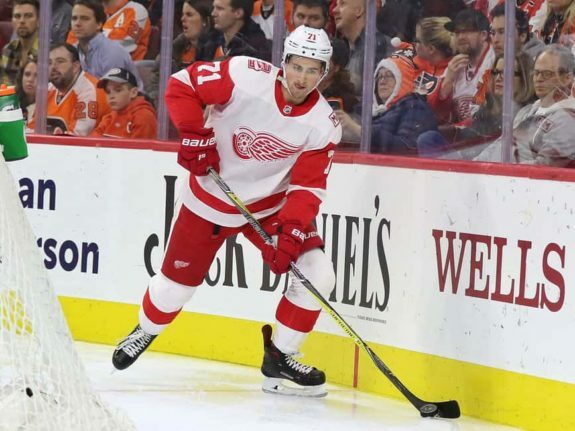 You’d be hard-pressed to find an analyst—or fan for that matter—that won’t say this is Dylan Larkin’s team with the “retirement” of captain Henrik Zetterberg. Behind Larkin sit other rising players, as the old ways of the organization yield to the future. The predictability of the Red Wings is changing during the rebuild as speed, skill, and development take the forefront of the team. 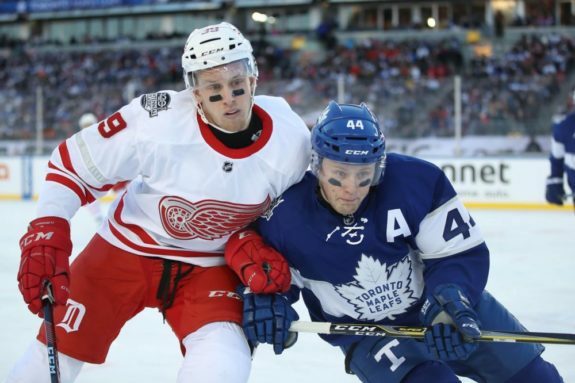 The new era will bring fresh names, which will establish themselves in Hockeytown starting this season as the healthy internal fight for stats begins. Mantha has been a goal scorer everywhere he’s played, and he’s shown flashes that suggest he can translate that skill to the NHL. The 24-year-old is entering his second full season with the club, coming off a 24-goal and 48-point season slowed by inconsistency. The power forward’s 24 goals last season led the Red Wings, and he’s primed to not only lead the way again, but build on that number as he aims for 30 goals in 2018-19. Related: Red Wings Next 30-Goal Scorer? Mantha has an NHL frame, standing at 6-foot-5 and 225 pounds, and he even took up boxing over the summer to help build his mental toughness and inner drive. Similar to Larkin in 2017-18, Mantha could be a breakout player ready to fulfill his 20th overall draft position in 2013. Detroit’s hometown hero is on the path to be the Red Wings’ next star. He broke onto the scene with a flashy rookie season in 2015-16, scoring 23 goals and 45 points, taking a trip to the All-Star Weekend (where “set the record” as the fastest skater), and displaying the skill to be the team’s future. A dreaded sophomore slump brought doubt among many, but he proved them wrong during year three. 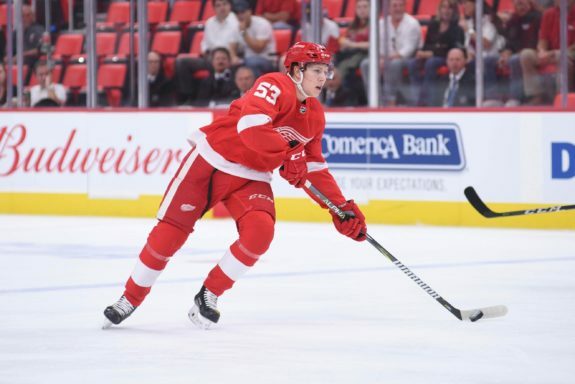 Larkin led the Red Wings with 47 assists and 63 points while showing the capability to be a reliable center and special teams asset. His 47 assists placed him tied for 33rd in the league, a solid place to be for a basement team. He’s embraced his playmaking, and playing alongside Mantha full-time in 2018-19 will greatly benefit both players. In August, Larkin inked a five-year, $30.5-million extension to help see the rebuild through as the go-to player and likely next team captain. The 22-year-old’s skillset suggests there’s still anther level to his game as he exudes confidence and a determination to be the best. His breakout season was lacking just one thing, goals. But in year four, he can be expected to put it all together with budding linemates and an evolving all-around game. He’ll play huge minutes and be the go-to forward in all three zones and on both special teams. Larkin’s playmaking and shot output—36th in the NHL for shots on goal in 2017-18—coupled with a bounce back from a career-low shooting percentage have him on the cusp of the 70-point plateau for the Red Wings. Again nodding to Larkin’s playmaking ability and his embracement of passing, a full-time role alongside him will be huge for Mantha, who will be Detroit’s clear top winger come season’s end and be a force entirely on his own given his size, skill, and reach. He’s a positive possession player, meaning he controls the puck and often carries the play when he’s on the ice. As the net-front presence for a power play with no real option but to be better, he’ll see plenty of rebounds and looks in the slot, which will help him reach 30 goals. His natural progression will allow him more opportunities and once he builds more confidence, his quick, high-powered shot will be instinctual with the puck on his stick, helping to pile on the shots. In 2017-18, Mike Green led all Red Wings in ice time, playing an average of 22:05 per game. Every other team had a defenseman play more minutes per game than Green; in fact, 54 total defensemen averaged more ice time. A large part is due to Green’s age (he is almost 33 years old) versus other teams’ top defensemen. Enter the 20-year-old Cholowski, who tore it up during the preseason for Detroit and is poised to take over the blue line this year. His solid two-way play and huge upside will earn him big minutes, even through the guaranteed growing pains and rookie mistakes. Cholowski is a smooth-skating puck-mover who has come a long way from being “over-drafted” at 20th overall in 2016. It’s a lot of minutes for a rookie defenseman, but this season is about the kids, and with the postseason far out of reach, they should get plenty of slack to develop.